Tips for Hiring a Carolina Criminal Defense Lawyer in North Carolina or South Carolina A fraction of the nation’s lawyers limit their law practices to criminal, traffic, and defense of serious offenses like DUI-DWI (drunk driving). 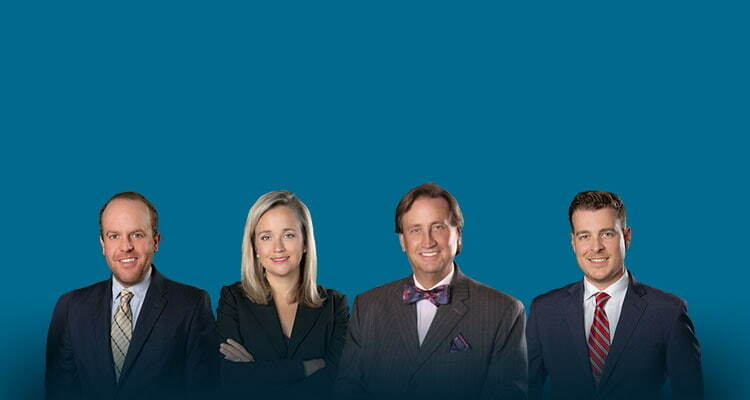 North Carolina lawyers in Charlotte NC typically cover other practice areas, such as personal injury law, or divorce. Our Carolina lawyers maintain two Mecklenburg County law office locations, and one just over the South Carolina state line, in Rock Hill, SC. The percentage of SC criminal attorneys located in Rock Hill where our York County office is located is (similarly) a fraction of all lawyers in that area. Most law firms diversify, especially in smaller cities. Through our main Charlotte criminal defense law office, a single phone number can access all three of our law office locations: (704)-342-4357 [704-342-HELP]. Our Carolina attorneys handle state crimes, felony or misdemeanor, in all courts across the State, from our Charlotte, North Carolina criminal defense firm. Plus, the same availability for felony and misdemeanor representation in South Carolina criminal prosecutions exists for state courts in the Palmetto State. We like going to either the NC or SC coast, so call us if you were arrested while on vacation! Should I Hire a Criminal Lawyer to Defend Me? To get capable, zealous representation, it helps to have a criminal defense firm on your side, directing the many decisions that have to be made in criminal proceedings. The whole point is working to achieve a favorable case resolution. Having an experienced criminal justice advocate to handle your defense is important. That’s true whether for an alleged South Carolina criminal law violation or for a North Carolina arrest. The necessity of access to legal counsel in criminal matters is why our US Constitution provides “appointed legal counsel.” Appointment of a criminal lawyer or public defender to represent you is not always free legal help. The Court may order reimbursement for the appointment of legal counsel and for their services. A lot comes down to the determination of whether someone is “indigent,” and does not have the ability to retain private legal services for criminal defense matters. The appointment of a criminal defense attorney in North Carolina is limited to certain types of cases. The Court is also required to determine the likelihood of an active jail term in deciding whether to appoint a lawyer for legal assistance. It is NOT automatic and as already mentioned, it is not always free or without charge. South Carolina has its own rules and procedures regarding indigent appointment. Sentencing for both felony and misdemeanor criminal cases can be notoriously complex. A lot depends on what happened on the scene and often takes into consideration things like prior criminal history, criminal history “points” and the type and severity of criminal charges. The famous case of Gideon v. Wainwright in 1963 established this principle of the Right to a Criminal Defense Lawyer under the 6th Amendment of the United States Constitution, relating to due process of law (assuring basic fairness in criminal legal proceedings). Our Constitutional rights only have TRUE value when the laws of our country protect those who are unable to afford to hire a criminal defense attorney. Justice is said to be blind. Having money is not a condition for fairness or justice in our courts. Justice must be blind to wealth and personal affluence. It cannot give special treatment in court to people who are rich. The principle behind Gideon has been somewhat eroded, since many states, including North Carolina, now mandate that the money paid by the state government on behalf of the destitute citizen’s criminal case must be repaid by the accused. That happens if they enter a guilty plea or are found guilty after a trial. In North Carolina, a “civil judgment” for attorneys fees may be imposed after the case is concluded, if the person charged with a criminal offense is found either guilty by the Court, a jury, or pleads guilty to the charges. Normally a judge will make inquiry into the time spent on a matter by the lawyer, the proposed or submitted petition for legal fees, and whether they are appropriate. As money has become more-and-more tight in the legal system, more harsh laws are going into effect, requiring the Courts to strictly enforce the payment of court costs. Undoubtedly, an accused citizen facing a well-trained prosecutor’s staff faces substantial difficulties with self-representation, in almost any criminal prosecution, misdemeanor or felony. Prosecutors for the State, in both North Carolina and South Carolina Criminal Courts, are well-trained, experienced, and focused on representing the State’s interests in public safety and law enforcement. Make no mistake, prosecutors bring cases to trial in criminal court when they believe they can obtain a criminal conviction, and when they believe it both legal and appropriate, will ask for active terms in prison or jail. It’s nothing personal. They are doing a job. As legal professionals, we firmly believe it is a mistake to represent yourself in criminal court, even for a minor criminal charge. While you may always serve as your own lawyer, in our experience as lawyers, that has the potential to turn out badly. Lawyers provide information about the best and worst-case scenarios, they explain how the court system works, what evidence may be presented at trial, and provide solutions to legal problems. As criminal defense lawyers, we want what is best for you personally and your case. While we cannot promise a certain result or verdict, we can promise to listen to you, to work diligently to prepare your case for trial, to provide and explain your options, and to work in your best interests. We are here to help. That’s why our telephone number is: (704)-342-HELP. That number works for both our North Carolina and South Carolina law offices. From the moment a citizen is arrested and booked for criminal charges, a game plan is needed from a Charlotte criminal defense attorney. Your criminal attorneys should be assigning things for you to do for a future court appearance, as well as going over the preliminary steps he or she will undertake, on your behalf. While attorneys prepare and collect vital evidence for your case, they need for clients to stay out of new trouble, and will seek to protect you against further self-incrimination, by advising you how to conduct yourself when your case is pending. These guidelines are some the benchmarks of real world criminal defense representation. Experience has taught our criminal lawyers that immediately documenting potential witnesses or asserting legal issues can pay big dividends later in your case. Preparation and hard work can make the difference between a “guilty” and “not guilty” verdict in criminal court. Staying on top of time-sensitive issues and noting names and addresses of key witnesses for use later in Court, at the outset of being retained, may be initiated by your criminal defense attorney. Similar to a ship’s captain, your criminal lawyer charts a course starting on Day 1, and tries to navigate the criminal prosecution toward the dock in a safe harbor, which is located just over the horizon, beyond where the client can see. Early action by a criminal law advocate (on your behalf) in some criminal cases involving serious traffic offenses (such as a DUI car accident involving personal injury) can make a huge difference. In car crash cases involving your arrest, many people need to report the collision to their liability insurance company, and do not realize that what is told to that insurance adjuster in the civil part of your case MAY be later used against them in a criminal trial. Our lawyers for criminal defense help to guard against harmful admissions and unnecessary self-incrimination. Navigating the legal system requires careful consideration of the consequences on multiple fronts. What Is a First Appearance or Arraignment, When I Am Due to be in Criminal Court? It depends a lot on the jurisdiction. The criminal defendant will have an arraignment, or sometimes an initial court appearance or “first appearance” after being charged, whether or not they have bonded out or are bonding out of jail. This legal proceeding is the phase of your prosecution where normally the Prosecutor is tasked with formally notifying you of exactly what criminal charge or charges you face. Again, it can get a bit complicated and a lot depends on where you were charged, whether that is in North Carolina or South Carolina, and the type of criminal charges, the level of the offense as to misdemeanor or felony, and the stage of proceedings. Where appropriate, your criminal lawyer in Charlotte NC or York, South Carolina can also file certain pleadings (written documents) like a Motion for Discovery for felony charges, to demand the prosecutor to disclose names of witnesses, provide the arrest video, officer notes, reports, and summaries. If applicable in your case, your defense lawyer will also seek to have the prosecutor turn over DUI or DWI checkpoint supervisory “programmatic level” documentation, to verify that the roadblock was Constitutionally established. Depending on the type of charge and local rules in the jurisdiction, that may be done by agreement. Other times it could take your defense lawyer issuing a subpoena or filing formal motions for the release of information and materials. It can get complicated in our criminal courts. Knowing what paperwork is needed, to help determine your chances to beat a DUI or other criminal charge, is what you pay criminal law professionals to handle. Don’t procrastinate, and try to hire a Charlotte criminal defense lawyer just before your arraignment or other court deadline. Meet with and hire an experienced criminal defense attorney in Charlotte or Rock Hill, and do it well in advance of your arraignment or first court appearance date. You will benefit from shifting this burden off your shoulders and onto a criminal defense lawyer, who can defend you and guide you from beginning to end through the criminal justice legal process. 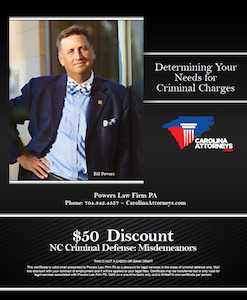 Bill Powers, Founding Partner, is the author of North Carolina DWI Quick Reference Guide, written for DWI lawyers, prosecutors, judges and law enforcement officers throughout North Carolina. The format and layout of his NC DWI-DUI book make it easy for clients to understand, too. We also provide a bound copy of the North Carolina DWI Quick Reference Guide to clients, free of charge. Mr. Powers has been a regular legal seminar speaker on both criminal law and DUI defense the better part of the last two decades. He has taught seminars in North Carolina, South Carolina, and Georgia on DWI-DUI defense. He has also been a co-chair of the NCSCCLE or North Carolina South Carolina Continuing Legal Education program. Bill is recognized by the National Board of Trial Advocacy (which oversees the National Board of Legal Specialty Certification) as a Board-Certified Criminal Law Specialist. Chris Beddow is the sole attorney at Powers Law Firm PA licensed to practice law in the State of South Carolina. He is also a member of the North Carolina Bar, and practices criminal law, drunk driving defense, and defends traffic ticket cases, and drivers license suspension issues. All of our criminal defense attorneys provide consultations for criminal cases during normal business hours. Plus, our criminal justice lawyers provide an after-hours service, with an “on-call” attorney available to you for emergency situations so that you can obtain legal advice from an experienced criminal defense lawyer, who is just a phone call away. Our same main office phone number is answered 24 hours a day, so just dial 704-342-4357. At Powers Law Firm PA it is our strong belief that gathering the full case history and scouring every aspect of the police investigation helps all criminal defense lawyers, whether associated with our firm or another law firm, obtain the best results. Full case information and comprehensive preparation of a file for trial are the foundations of a powerful legal defense. Our Carolina lawyers want you to understand how we are approaching your criminal charges, and how the legal system works in the North Carolina criminal courts or South Carolina court system. The benefit of being part of a law office focused on criminal defense is that we collaborate with each other to find solutions for our clients. Our criminal justice law office provides FREE legal advice for each client’s initial lawyer consultation. Our view is that most people making an important “life decision” will want to meet their potential legal representative, in person. We also can answer questions via secure video conferencing. Sometimes that helps friends, family, and clients when they live in places other than North Carolina or South Carolina. Use the same care and concern you would in making other important life decisions such choosing a surgeon, finding your spouse or life partner, or handling your life-savings. What is the worst-case scenario for my criminal case? What is the best-case scenario? Should I take a plea deal or go to pre-trial motions and a possible jury trial? Do I have to be present in court at every stage of the criminal proceedings? What happens to my driver’s license, which was taken from me after my arrest? Will I have to serve more jail time, if I am found guilty for my misdemeanor case? Can your criminal defense attorneys obtain a first offender plea for drug charges? How long will it take to resolve the criminal charges against me? Will I be asked to take the witness stand and testify? To hire your law firm, what is the DUI attorney cost? Our law firm’s goal is to provide you the information and legal resources you need to understand your pending felony indictment, traffic citation, or written misdemeanor accusation charges and what you should be expecting to take place, as your criminal case moves through the criminal justice system. DWI-DUI WARNING: If arrested for DWI in North Carolina or South Carolina, make certain that you call us immediately, for FREE legal advice on protecting your driving privileges. Both states offer a limited amount of time to act, sometimes as short as 10 DAYS, but the procedures are vastly different, so call NOW for immediate help, in either NC or SC, at 704-342-4357.